Whatever your role within the building trade, getting the support you need to achieve the highest possible standards for both public and private sector clients is important. The electrics of a building are just as important as its external fabric, and ensuring that all wiring is correctly organised, easy to access and fully supported is vital. A cable tray is integral to achieving this objective, and whether you wish to purchase a straight cable tray or stainless cable tray, these structures provide support to insulated electric cables, including those used for power distribution and communication. Available in a range of light, medium and heavy patterns, our cable trays provide a better alternative to open wiring and electrical conduit systems for commercial and industrial applications. We stock a number of tray types here at DP Building Systems to ensure you can source the cable management system that is right for you. Our cable tray range includes straight cable trays, 90 degree flat bends, equal tees, adjustable risers, flat 45 degree bends, internal risers 90 degree, external risers 90 degree, flat tees, crossovers, reducers, couplers and even products that have been hot-dipped galvanised for extra corrosion resistance. 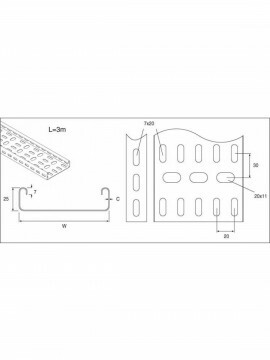 In addition to using our experience and expertise in cable management and support systems development, we also ensure all cable trays supplied by us comply with British Standard 61537:2007, whatever material, finish or tray type you choose. By working closely with our suppliers you and your wider organisation can not only benefit from an exciting range of cable management solutions, but also the best prices around, both of which enable you to meet and exceed the expectations of your own customers and satisfy your commercial objectives. To find out more about our cable tray options, including our selection of straight cable trays and stainless cable trays, please contact our team today on 0121 706 7777.